Copper Purity Test Apparatus - S.S. Instruments Pvt. 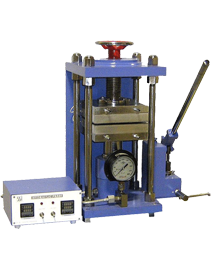 Ltd.
Copper Purity Apparatus is designed to determine the purity of copper by electrolysis method. The sample containing copper is dissolve in sulfuric -& nitric acid mixture and a regulated current is passed through the solution. The copper is deposit on Cathode which is weighed to determine the amount of copper in the sample. Test Chamber : The Test is conducted in a Glass Beaker enclosed in an acrylic enclosure. 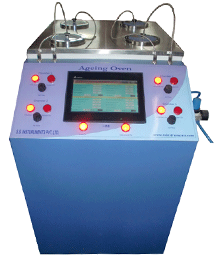 Copper Purity Apparatus is designed to determine the purity of copper by electrolysis method. The sample with Copper is dissolve in sulfuric – acid and nitric acid mixture. After the metal is dissolved, A current is passed into the solution using anode and cathode. Due to the passage of current, the copper is electrically charged and get deposited on the cathode. The electrodes are weigh before and after the test to determine the amount of copper deposited on the electrodes.